Take your Joy and check out our sneak peek of Compulsion Games’ new dystopian survivor, We Happy Few! While there are very few videogames that drugs wouldn’t improve, Compulsion Games’ We Happy Few takes the cake in requiring a sober experience, at least for the first playthrough. With a hype train that started in PAX East and carried on to E3, We Happy Few finally launched into Early Access with all required fanfare, and while the experience so far may be stymied by a lack of available content and mismanaged survival mechanics, the dystopian world of Wellington Wells shows promise beyond my wildest, drug-induced dreams. Set in the “retrofuturistic” world of war-torn Great Britain in the 1960s, We Happy Few kicks off with a glimpse into a society fueled by anti-depressants and severe paranoia. The alpha starts players in Wellington Wells, a decidedly British town with all the cozy feel of Orwell’s 1984, and it quickly becomes apparent that the class divide between the happy “Wellies” consuming “Joy” (an anti-depressant created to erase all bad thoughts) and the “Downers” refusing the drug is one rife with strife. Assuming the role of Arthur, players immediately have the choice to continue dosing or leave the pill behind (a total Blue Pill/Red Pill moment). Through a series of unfortunate incidents that lead to Arthur’s banishment to the town’s decrepit outer limits (where all of the other sober malcontents are forced to reside), players must scavenge and fight their way back into the city and uncover the history of their medicated metropolis. The full game promises two other renegade characters, each with their own interweaving storylines and complex histories. 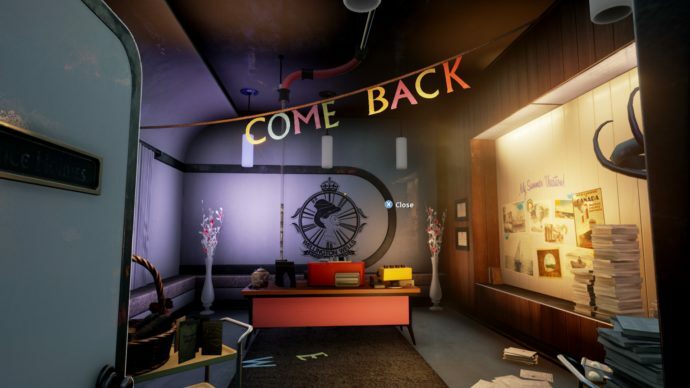 The name of the game in We Happy Few is story-driven survival. With Sleep, Food, Thirst, Poison, Health, Stamina, and Sickness meters to manage on a constant basis, it soon becomes apparent that the bulk of the player’s attention will be spent balancing everything out. While the game also offers a large number of main and side missions, some bordering on the Borderlands side of kooky, the amount of emphasis put on maintaining life in Wellington Wells (and the inherent difficulty of constantly scavenging) leads me to believe Compulsion Games hasn’t quite found the right balance. Consumable meters such as Sleep, Food, and Thirst drain at a ridiculous pace, and their immediate effect on overall stamina and regeneration hamper the game’s flow. Too many times I found myself sidetracking to raid several bombed out houses instead of continuing on to the main mission because I was slowly dying of what I could only assume was a weird combination of starvation, dehydration, consumption, and insomnia. This in and of itself is the point of a survival game, but your typical Rust and Day Z don’t feature an actual storyline or main missions to carry on to a certain end. Too much is lost in understanding the gravity of each mission when I spend so much time looking for rotten carrots the the subsequent pills necessary to quell the incoming food poisoning. The actual gameplay in We Happy Few harkens back to Dishonored. While you have basic attacks and blocks, there seems to be a strong emphasis on sneaking and stealthy takedowns. 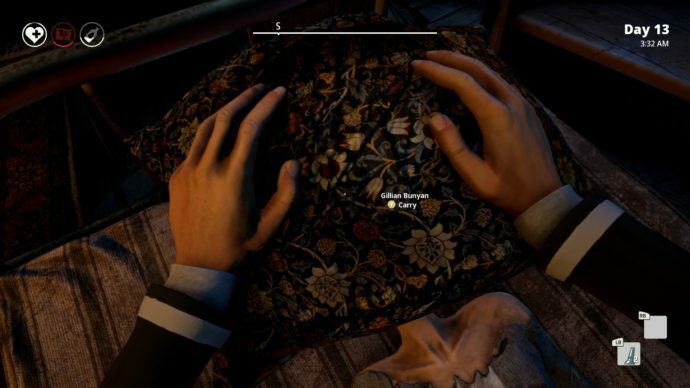 With handheld weapons ranging from a pointy stick to a cricket bat and consumables such as tear gas, rocks, and timed bombs in the shape of a rubber duck, We Happy Few attempts to pack in a lot of alternatives to somewhat simple combat. Though it may just be a feature of the Early-Access nature of the build, the stealth so far leaves something to be desired, as each NPC seems to have X-ray vision and your exact GPS coordinates if you come within fifty feet of them. The AI, along with the stealth mechanics, seem a bit natal in complexity as well, and several clipping/navigational errors left certain characters floating over beds or stuck in corners at least a handful of times. One interesting and oddly fitting feature is the permadeath option; the aforementioned status overload can kill you pretty quickly, but the idea of fighting for as long as you can in a world like Wellington Wells seems aptly fitting, and you can always go back to being a wimp with unlimited lives. Or you can just smother everyone with a pillow while they sleep. Your choice. Apart from several instances of getting my hitbox snagged on a piece of fallen masonry while trying to run from the crazed population, the actual movement in-game is surprisingly smooth. Climbing, running, and navigating objects in the overworld worked perfectly. Unfortunately, the same cannot be said for the inventory menu, which goes down as smoothly as a piece of glass in a cup of frozen yogurt. Maybe it’s more manageable with the mouse and keyboard, but I wanted to take full advantage of the controller interface, so I guess the joke’s on me. The onscreen HUD, when not crowded with status warnings, is pretty minimal in a helpful sort of way, but I do find the lack of waypoint marker settings to be a bit of a pain. We Happy Few’s visuals and sound mesh perfectly with the game’s overarching theme. The dingy warrens we find ourselves exiled to seem all the brighter when we take a dose of Joy, and the voicing cast sounds varied enough to just verge on being repetitive. The game’s claim to a procedurally generated world and thus a different experience for every player is also a nice touch, though it inevitably means that everyone just gets a different mashup of the same seven buildings and parks. Overall, the game is pretty and the character skins are only slightly repeated (though the clone-based constables must have saved Compulsion Games quite a bit of time). 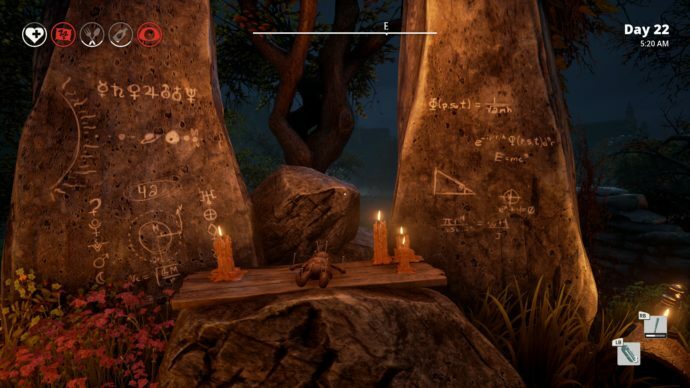 Math and voodoo, though one wonders why the two are ever considered separately. *Note: The author was not under the influence of Joy while writing this preview.